Whopee! I managed to make some little electrons! 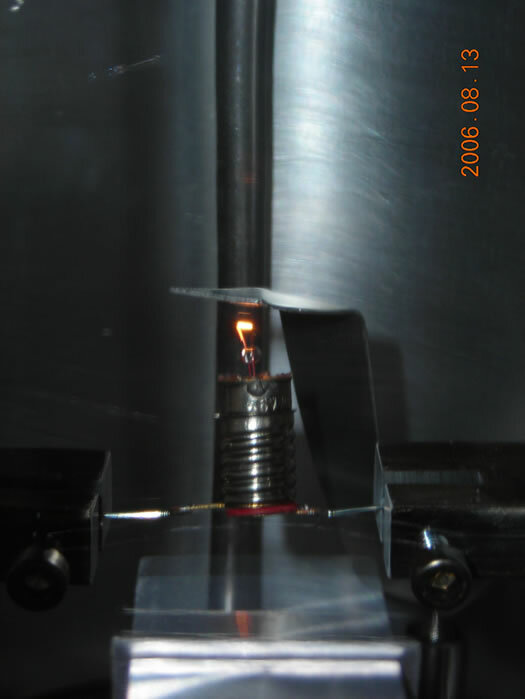 I wanted to see if I could detect any sort of emission of electrons from a heated tungsten filament. Here's the circuit of the basic setup I used. The filament power supply heats the filament and the high voltage draws the electrons off to the anode. Here's a shot of the whole lot set up on the bench. The filament is from a 6V bulb - simply cut the top off with a grinding disc. I had to cut a little slot in the base of the metal cap on the bulb to let the air out from behind the bulb capsule as the chamber is pumped down. The anode is a sheet of aluminium placed about 3mm from the filament. It is connected to the HV feedthrough fitted to the baseplate. The pressure I used was 4e-5 mBar (not particularly good, probably because of outgassing. The bulb holder has a fiber disc in it which will trap air). And hey presto - electrons! 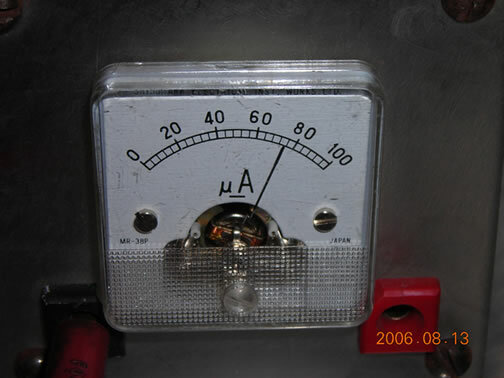 The meter is reading about 75μA of beam current. Anyway, some measurements. The graphs below show the current/voltage relationships for four different filament currents. First of all, notice how the filament current affects the beam current. This is possibly due to the filament operating just on the threshold of thermionic emission - any small increase would push the filament over the threshold (i.e. give the electrons an energy greater than the workfunction of tungsten) and give a big increase in beam current. 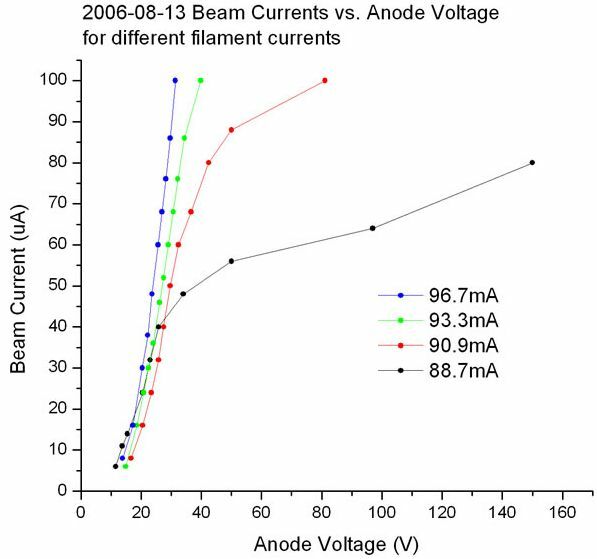 Notice also the "knee" in the curves - for a filament current of 88.7mA this "knee" occurs at around 40V anode potential. The region where the anode voltage is less than this "knee" voltage is the space-charge limited region. Above the knee voltage, there is no space charge region left i.e. all the elctrons generated by the filament are instantly drawn over to the anode. 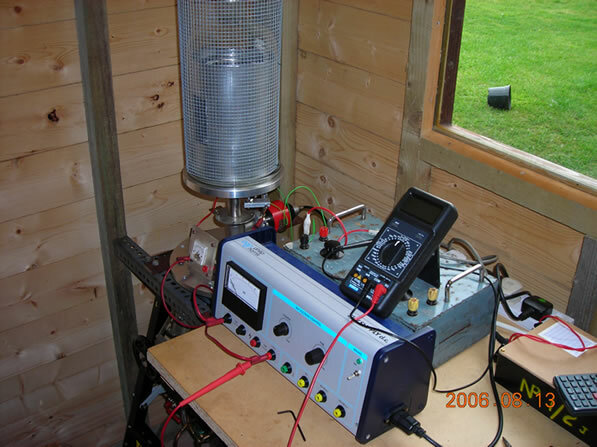 For any further increase in anode voltage, there is only a slight increase in beam current. The knee voltage will increase with increasing filament current because of the larger number of electrons and larger space-charge region generated. Apparently, a mixture of barium & strontium oxides has a workfunction of only 1eV and will thus generate electrons at only a red heat. Thorium dioxide, while the best material, is slightly radioactive and I can't find it in any of the chemical catalogs. I'll try and hunt down some barium or strontium oxide and see what I can get. The usual way of applying the oxide is to make a runny paste of the oxide in water, dip the filament in and let it dry out. The oxide is left attached to the filament. If I get some time I'll give it a shot and see!